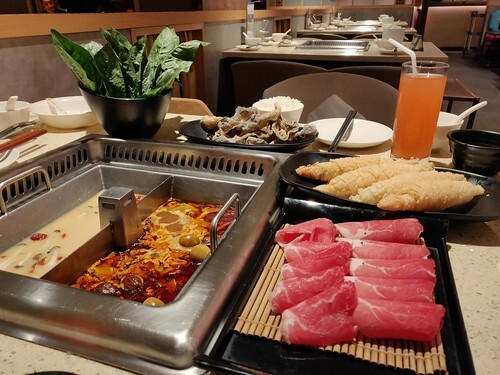 This upscale hot pot place may have an awkward-sounding English name, but it's based on its Chinese name...and probably also to draw attention to their signature collagen broth, which was thick and Tsukada Nojo-like. But it wasn't really my thing, nor was their spicy broth either, which was more muted and sweet than in-your-face spicy and salty. Likewise, the lamb was tender but didn't really have the gamey taste of lamb that I was looking for. It was all of good quality, but at a high price too. Anyway, this small chain is from the Paradise Group, and presumably is meant to compete against the likes of Haidilao given both its children's playground in front as well as its late hours. Their staff also does those really deep long bows at your table like Ding Wang does. My preference is still for Xiangtianxia (which apparently has since picked up a new English name, Spice World Hot Pot) or its friendly competitor Da Miao just down the way at Clarke Quay. Or if I'm up in Taipei, then Quan Alley.